A story to good to pass up. 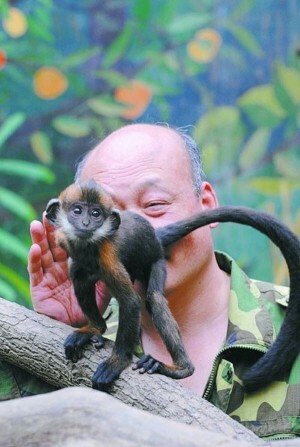 When an irresponsible visitor to Wuhan Zoo fed a rare 3-month-old Francois’ langur (monkey)- the first to be born at the park in 10 years- a peanut, senior breeder Zhang Bangsheng sprang into action. Using warm water to clean the animal’s bottom, he then began to lick it, not stopping for over an hour, until the little monkey defecated the offending food item. ‘It could have been life threatening’ explained Zhang.